Grilled on a beech wood fire. 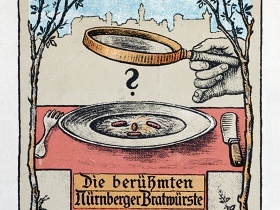 Or would you have the blaue Zipfel - a Nuremberg sausage in an onion and vinegar broth? Find original and traditional recipes! Local delicacies need a homeland. 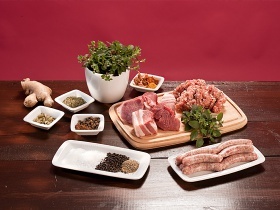 Loved, appreciated and protected: Learn more about the protection of origin of our Nuremberg Bratwurst. Destroyed in the War but never forgotten. Probably the most famous restaurant after Auerbach's Keller hosted illustrious guests of its time. Discover how it rose to fame! 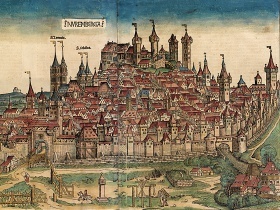 Our small, fine sausage is produced in the city of Nuremberg. They have been produced here for over 700 years. A clear definition of the ingredients as well as regular inspections have all helped us to produce a top quality product. Pig meat, salt, pepper and the fine marjoram note. This is a good product with a sound basis. Curious stories are told about this small celebrity. There is bound to be a grain of truth behind them. At the game 1. 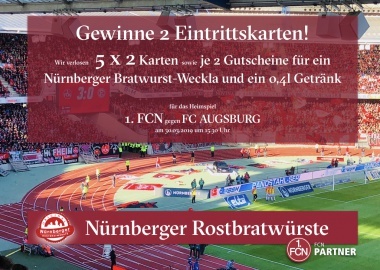 FC Nürnberg versus FC Augsburg on the 30th of March 2019 we raffle five times two tickets and 2 vouchers for "3 Nuremberg Bratwurst in a bun" and a drink 0,4 l.
1. 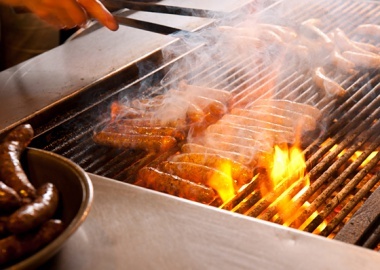 Like the facebook-fan page of Nuremberg Bratwurst. 2. Mark the person who you would like to go to the game with. BBQ with the Pros of the FCN for charity! 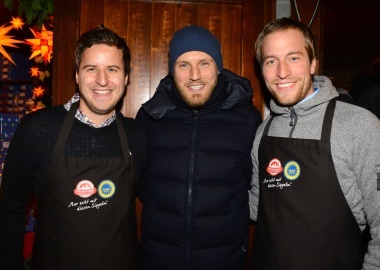 A long traditions is to be continued: the team of capitain was grilling Original Nuremberg Bratwurst at the world famous Nuremberg Christkindl market; the earnings are contributed to the foundation NÜRNBERG-GEWINNT. 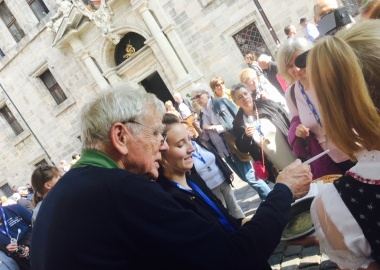 The Bratwurst city tour offers stories from the medieval times into the presence. Althoug the typical Nuremberg Bratwurst is "only" 9 cm today, it is able to combine vision and tradition in a fascinating way and for sure it is a real seduction. 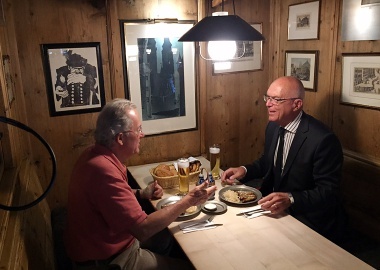 World Food Speciality Heritage, Bavaria spoke to Christian Jürgens about the consequences of this culinary star magic, about the connection between creativity and craftsmanship and why Bavaria simply tastes different from other places. 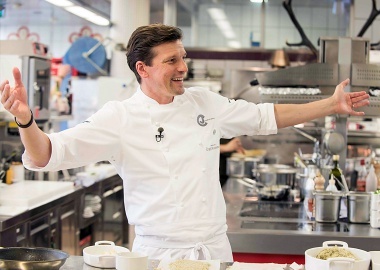 Together with his team in the "Überfahrt" restaurant on the Tegernsee, Christian Jürgens received his third Michelin star in 2013. This is the highest award a chef can gain. On Monday the 21st of September the American film team of Joseph Rosendo, Travelscope, visited Nuremberg. We were very enthusiastic to serve the team our faboulos Nuremberg sausages for lunch in the famous Bratwursthäusle. Our new internet site has a completely new design! 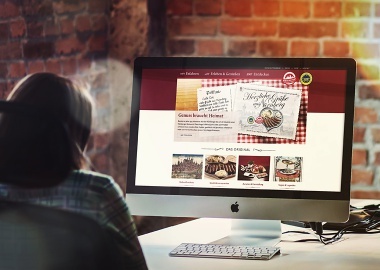 The display is more lavish, more modern and above all user-friendlier. The Nuremberg sausage makes a guest appearance in Bella Italia! With over 50,000 trade visitors from 122 countries, the Tutto Food is the most important trade fair in Italy. 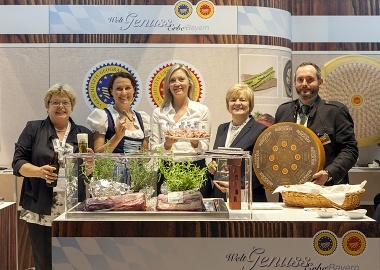 World Speciality Food Heritage Bavaria was represented for the first time at the Tutto Food trade fair in Italy. Together with its partners it exhibited aspects of its work over the four-day event. Grilled, fried or cooked? In addition to being cooked on the traditional grill, the Nuremberg Rostbratwurst sausages are of course also tasty when prepared in a pan and in a stock. Whether you prefer to cook them in a traditional way or to be creative with them, you will find many tasty recipe ideas in our recipe section. Where could be a better place to experience the Nuremberg sausage than in one of the traditional sausage restaurants where they are cooked on beech wood fires? Nuremberg people also enjoy drei im Weckla, three Nuremberg sausages in a bread roll as they walk through the city.